Geomagic Freeform is the industry's leading creative digital sculpting and 3D artists modelling software. The freeform design approach uses human visual and tactile interaction strongly in the modelling process, rather than drawing solely from precise engineering data. Geomagic Touch (formerly Sensable) is 3D scribe haptic device which connects to your Windows computer and allows designers to "touch" or "feel" shapes modelled in 3D virtual "clay". 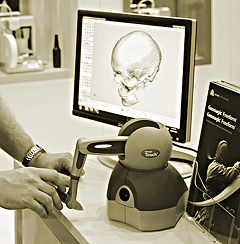 The Touch device works together with Geomagic Freeform to offer a full 3D virtual sculpting experience. Freeform Design uses voxel modelling technology, free of the constraints used in traditional CAD software. There are no surface boundaries to divide or solid model features to select. The designer is free to interact with the model as one organic body and make changes anywhere and any way the designer wishes. 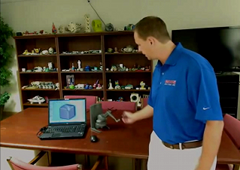 Freeform file support allows the user to create new models or edit existing scan or 3D printing STL files. Freeform Plus offers additional Mesh -> NURBS surface conversion, SUBD modelling, and other tools. Freeform manufacturing tools allow users to repair mesh problems, analyse mass properties, define cavity lines for moulding, and much more. Users may save finished models back to STL for 3D printing, or convert to STEP, IGES or PARASOLID format for use in Geomagic Design, SolidWorks, Inventor etc. "If you have an idea in your head... then Freeform is the ultimate" - Sculptor Simon Goodall, Synapse Ltd.
Sculpt beautiful, detailed and imaginative 3D models using the Geomagic Freeform and Touch system. 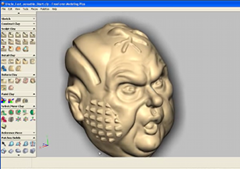 Digital Sculpting allows designers to create any shape, without the limitations imposed by "normal" CAD software. A key benefit of voxel based sculpting is that voxels allow complete freedom over form. The topology of a model can be altered continually during the sculpting process as material is added and subtracted, refined and finished in similar fashion to real clay used by traditional sculptors. When used with Geomagic Touch device, Freeform results in a complete "see-feel-touch" experience of virtual reality modelling. Native 64-bit application for Windows® Vista/7/8/10 Professional editions with OpenGL graphics. 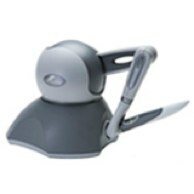 Mouse-only operation is supported, best performance when used with Geomagic Touch device. Geomagic Touch device includes driver software download. Requires ethernet connection. Complete solution: Easily create rough organic shapes or smooth finished content. Applications include medical, movie animation gaming and toys, apparel, jewellery, more..
Interface uses floating and docked tool palettes with command menu and hotkeys. 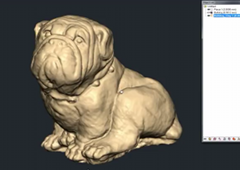 Sculpt from existing STL or OBJ models, 3D scanner data, or CAD models. Convert mesh to NURBS curves using autosurfacing technology for use in CAD. Smooth reduce or decimate model mesh. Hole repair. Analyse and fix utilities. Contact us HERE for more details about Geomagic Freeform or Geomagic Touch. "It was truly amazing to see how fast this shoe came together... he felt comfortable signing off on the design. All that was left for our team to do was execute the design." "I can make hypothetical iterations that could improve the design. If I don't like them, I just go back. Try that with clay!" "It is great to work totally free of strict regimentations and with little background knowledge about 3D modelling." Creating Decorative Cookware Freeform Demo. Log a support ticket with Geomagic. For current support subscribers only. HERE -> Download the free Geomagic Freeform Viewer. 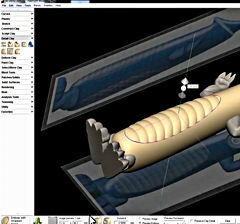 Original Sensable Freeform Claytools Tutorial legacy voxel CAD training document. Windows 10 Touch/Omni users with firewire will need the legacy firewire driver (KB2970191) and possible adapter like the StarTech 3 to Thunderbolt Adapter. Overview for the OpenHaptics®/QuickHaptics C++ developers toolkit for using Geomagic Touch device in third party applications. Haptics is the science of incorporating the sense of touch and control into computer applications through force (kinesthetic) or tactile feedback. Contact CADDIT for more information on OpenHaptics availability and pricing. CADDIT has been working with 3D Systems for several years and is pleased to release the Geomagic Freeform technology in Australia, which was introduced at the recent NMW in Sydney. Interested in Freeform's unique combination of haptic technology and voxel modelling? Geomagic Freeform demonstrations are arranged in most capital cities. Please contact us for information on attending the next event. Basic overview of the touch-feedback haptic CAD system. Organic and digital sculpting software. Advanced 3D digital sculpting tools in Geomagic freeform: 3D textures and more..
New features in Geomagic Freeform 2014 including analyze and repair STL mesh, text-on-mesh, etc.